After parts 1 to 4 of this series where we have mostly been loading and tweaking data for the Cycling Tweets, now it's time to have some fun querying this dataset with Cypher. All of the queries are on Github, but let me just walk you through a couple more interesting ones. Warming up the "Cypher Muscles"
Turns out that this is quite interesting. Very few of the "top gun" cyclists seem to be the top Tweeters. The only one that really stands out I think is Luca Paolini - the others are basically excellent riders, but not the "top guns". At least not in my opinion/experience of the sport. So lets take a look at the #hashtags. Which ones are most mentioned in Tweets? The big races like Paris-Roubaix and the "Ronde van Vlaanderen" (#RVV, or "Tour of Flanders") are the top mentions. You immediately see the "big guns" (like Tour de France winners Alberto Contador, Chris Froome, Cadel Evans) pop out. But this does not say a lot - so we want to do a bit more exploration of these top riders and see what they are really connected to. 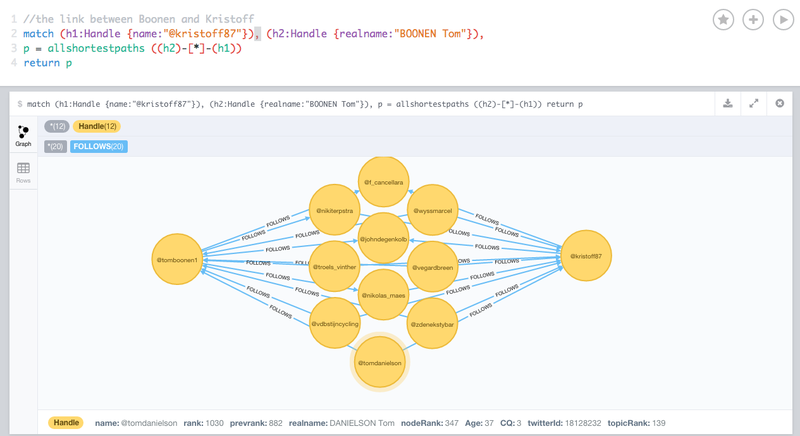 To paraphrase my dear friend Jim Webber, "Impossible is Nothing" with Cypher and Neo4j. Because here's the thing. When I was starting to do this little project, I did not know what I was going to find. I really didn't. Of course I knew a bit about Neo4j, I am a fan of cycling, but still... it was all kind of an experiment, a jump into the unknown. 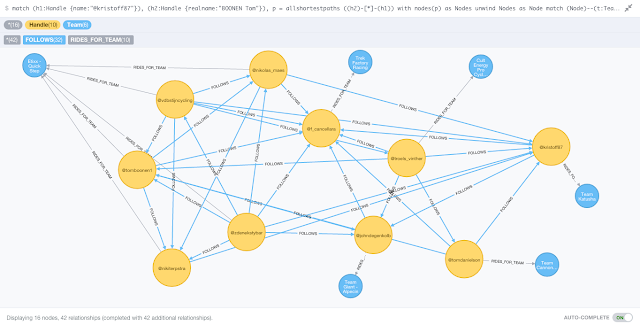 So this is where I fell in love - again - with Neo4j, Cypher, and the way it allows you to interactively and iteratively explore your data - hunting out the hidden insights that you may not have thought of beforehand. The WITH clause allows query parts to be chained together, piping the results from one to be used as starting points or criteria in the next. However, because I had to "LIMIT" the result, it felt as if I was artificially skewing the view. So lets take a second pass at this. 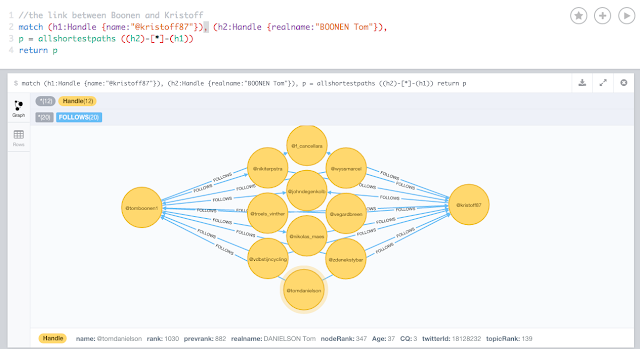 So that gave me some good feel for the dataset. 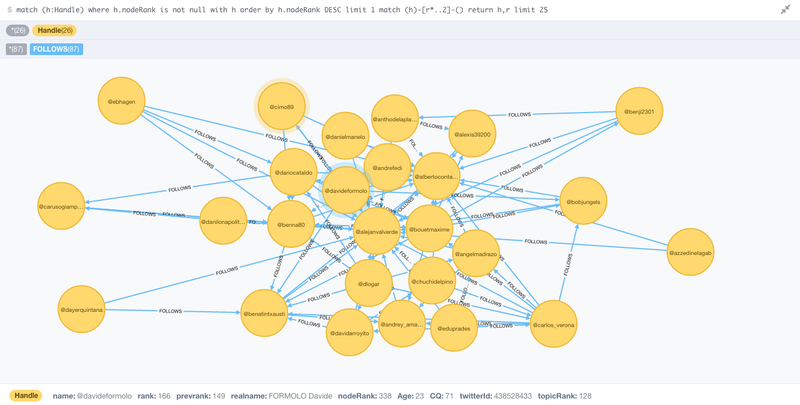 Again:I think it's mostly this interactive query capability that makes it so interesting. As you can see - this is quite interesting. It's clear that there are a number of lesser known riders that are very "between" the top guns (in terms of PageRank). So last but not least, we need to do some pathfinding on this dataset. In my experience, that always gives away some interesting insights. As you can see we are using the same principle as above: WITH ties it all together. 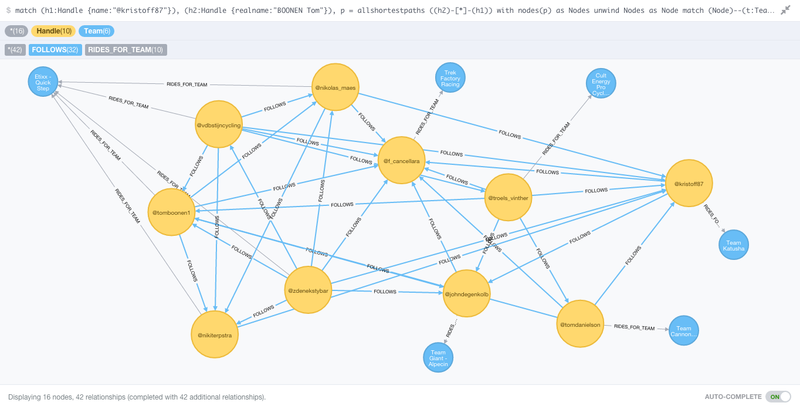 I guess you could have seen from this series of blogposts, that I am a bit into Cycling, and that I enjoy working this stuff with Neo4j. It's been a lot of fun - and a bit of effort - to get all of this done, but overall... I am pretty happy with the result. Please let me know what you thought of it too - would love to get feedback.